Advent is the liturgical season or period marked by the four Sundays preceding Christmas. In the Ancient Church it was a reflection of the season of Lent – a time of preparation, reflection and celebration before the feast of Easter (for Lent) and Christmastide (for Advent). The word Advent comes from the Latin for coming, or arriving. 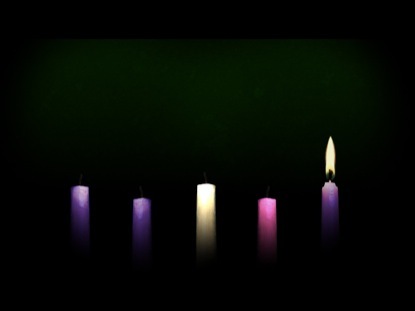 We celebrate Advent by special markers: the colors purple or blue and the Advent Wreath of 4 candles, one for each Sunday, culminating with the lighting of the Christ Candle (the 5th one) on Christmas. It’s a concrete way for us to articulate the waiting that defines this season. Advent has two faces, or two orientations. It looks to the past in the sense that is a recapitulation of the longing with which women and men of faith living in a bygone era anticipated the coming of God’s Messiah. And Advent also looks to the future in an attitude of expectancy over what God has yet to do in the life of humankind. (C. Cousar) It’s an active remembering, not a passive waiting, an ardent expectancy that God is at work in the world, is going to complete was has been started in the first coming of Christ. It’s an invitation to be alert, stay awake, be looking for God in creation – in the city – the divine invitation to join in with what God is already doing. The Advent texts, proposed by the Lectionary, the three year cycle by which the church reads and preaching through the Bible in ecumenical worship, contains a weekly reading of the prophets, the psalms, the pastoral church letters [epistles] and the gospel story leading up to the birth of Christ. We are invited to read, meditate and live from them not just as history of God’s people, but also as our continuing story as the people of God. The coming of Advent jolts us out of “ordinary time” to remind and declare to us the invasive good news that God’s grace is impending, on the cusp of presenting fresh possibilities of deliverance and wholeness. The passage from Jeremiah: judgment as salvation. This passage draws heavily on the prophetic language of judgment to make an important statement about God’s grace to come … “in those days.” Judgment is pictured less as destruction, than it is as a time of restoration and salvation. That which was intended for judgment is now purposed by God to be a moment of salvation. The love of God finds its desired fulfillment in the redemption of the people, but this same love also results in judgment on human sinfulness. Jesus gives an apocalyptic vision of the end, the last day, harkening back to the message of the prophets when they spoke of “in the last days…” Is it metaphorical or literal? Has it happened already, or not yet? For us modern readers the apocalyptic language (of violent upheaval and destruction) is complicated and can lead us to skip over the word underneath the words. We focus on the literal fulfillment (or not) of these events. But Jesus uses them as word pictures to get across a more radical message: God is at work in the world. Stay awake. Stay alert. Expect God to act. Watch and look for God’s leading, then join in. The language is larger than life in order to remind us that God is larger than life. How God acts in the world (and God’s thoughts) are not our thoughts or plans (See Isaiah 55). Watching and waiting are not easy, precisely because other things do interfere and distract. The passage from Jeremiah and Luke: apocalyptic judgment as transformational salvation. Jeremiah is not the only Biblical prophet to seize upon this future moment in God’s time (the day of the Lord) to proclaim a message of great joy. See also Jeremiah 23:5-6; Psalm 72, Joel 2:30; Acts 2:17-21; Psalm 46:6; Psalm 89:9. This judgment will be brought by a new king, sovereign, descendant of David (see Isaiah 11) – like a branch sprouting from a dead tree. 1. What troubles you and/or encourages you in these text? Why? How? 2. To look only at things that seem to be close at hand is to miss the larger picture. What distracts you from seeing the larger picture of what God is doing, or to expect God to act? 3. How might God be acting, waiting for you – or for us – to see the big picture and join in with the divine initiative already in progress? At work? ; home? ; CAPC? 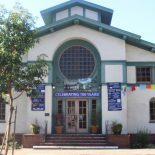 ; in Oakland? This entry was posted on November 28, 2012 by capcoakland in Uncategorized and tagged Blogging Towards Sunday.